Magnetic Resonance Imaging (MRI) of the breast is a painless diagnostic procedure that uses magnets and computers to create pictures or images of areas inside the body. It is an evolving and increasingly-popular imaging technique. Although is is not a replacement for traditional mammography, breast MRI is extremely helpful in evaluating mammogram abnormalities and identifying early breast cancer, especially in women at high risk. Breast MRI has been in use at Hartford Hospital since 2001 and about 400 breast MRI scans are done a year. The Hartford Hospital Imaging Center is accredited by the American College of Radiology for MRI. The new tool is called the Sentinelle breast MRI coil. It is an advanced Breast MRI diagnostic system that produces impressive, high quality breast MRI images. Better images mean a better, sometimes earlier diagnosis. Many factors affect image quality, including the ability of the patient to stay as still as possible. The new system’s advanced ergonomic design is more comfortable, using positioning “wings” and sternum rest. A more comfortable patient moves less, and reduced motion provides better image quality. It can be nerve-wracking to learn you need a biopsy. Hartford Hospital’s Imaging Center experts believe having more comfortable and efficient equipment can make the whole experience a better one. The American Cancer Society (ACS) recommends MRI examinations in addition to annual mammograms for women with an especially high risk of breast cancer. Screenings are recommended for women with one of the following: a BRCA1 or BRCA2 gene mutation; a first-degree relative (parent, sibling or child) with the above gene mutation; exposure to chest-area radiation between the ages of 10 and 30; or a lifetime risk of breast cancer scored at 20%-25% or greater based on one of the several accepted risk assessment tools. “Hartford Hospital is committed to providing the best in breast cancer detection and patient management,” said Jinnah Phillips, M.D. “The Sentinelle breast coil is a powerful new tool for our physicians and patients”. MRI is a painless diagnostic procedure that uses magnets and computers to create pictures or images of areas inside the body. Each image shows a thin, horizontal slice of the breast tissue. A computer compiles the images, which can be studied from many different angles. 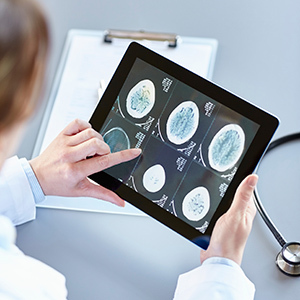 MRI scans produce hundreds of images that a trained radiologist interprets. MRI scans look for masses like other imaging techniques do, but the technology is sensitive to detecting increased vascularization or new blood vessels that feed tumors. Highlighted by the injection of a special dye, breast tumors enhance or “light up” on MRI scans. If a suspicious area is detected, your physician may recommend a MRI-guided breast biopsy. This type of biopsy may be a preferred alternative to a surgical biopsy. MRI-guided biopsy requires only a topical anesthetic, leaves little to no scarring and can be performed in less than an hour.